Home/Uncategorized/Why choose CBS for your Shelf Ready Packaging? We here at CBS have been manufacturing corrugated packaging for now over 20 years and along with that wealth of experience in our sector we have seen new innovative ways corrugated packaging has evolved, particularly in the retail industry. This evolution of packaging has led to the emergence of retail and shelf ready packaging (RRP’s and SRP’s, for short), these over the years have now become one of our specialist product lines. Smart packaging that transports your products from the warehouse, straight onto retailer shelves. As one of the biggest independent plants in the UK we can provide a one-stop service for your SRP needs, cutting your costs while providing you with only the highest quality corrugated packaging, but also provide an unrivaled expertise and service using the years of experience. We know, and have seen the importance on how retail ready packaging can build a brand. We can collaborate our printed manufacturing capabilities with you and your brand to make packaging that stands out from the crowd. Our investments in new flexographic printing, die cut machinery and technology over the years has given us the ability to now manufacture a massive range of custom SRP’s, printed with up to four colours. This is in particular ideal for the use in shelf ready packaging where first impressions can matter the most, giving you the ability to further increase your brand promotional messages with vibrant coloured printed boxes. We have an expert technical design team that can help you guide you through the steps it takes to produce packaging to your requirements. We will help you design and make effective packaging that cuts costs, provide maximum protection during transit whilst maximising the efficiency in the supply chain and once on the shelf. Generate more sales at the point of purchase with tailor made bespoke SRPs. Lower your costs and increase product performance with improved product availability and fast, effective stock replenishment. CBS manufacturer SRP’s & RRP’s that are strong and durable, but also we take into account our environmental responsibility when its comes to creating our packaging. Our SRP’s are 100% recyclable, using corrugated packaging and minimising the amount of material used with clever design means you are using packaging that not only helps your costs, but benefits your company image and the planet. 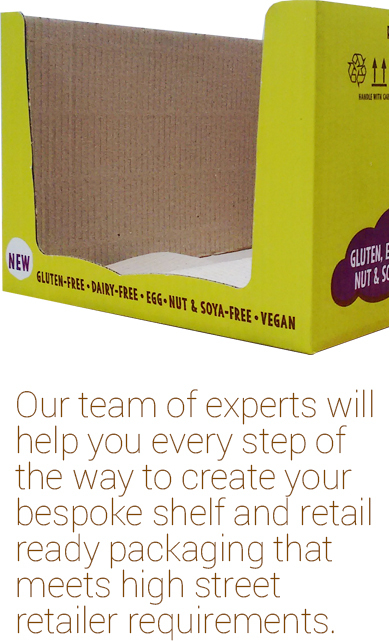 If you would like to talk to us about your packaging requirements, then your expert team can help you create your perfect packaging. Simple use our contact form, or give us a call on 0121 525 5555.